K – 5/32 or 3/16 diameter PVC welding rod glued in as a ball retainer. Buy the Schedule 80, 3/4 X 3/8 bushing adapter before the balls because there are differences between manufacturers of pvc plumbing parts. The part that I used has an opening of 11/16 inch where the ball sits. The ball must seal but also release easily with no sticking. If the opening is too large the ball will bind. Measure the ball seat opening in the bushing that you find. 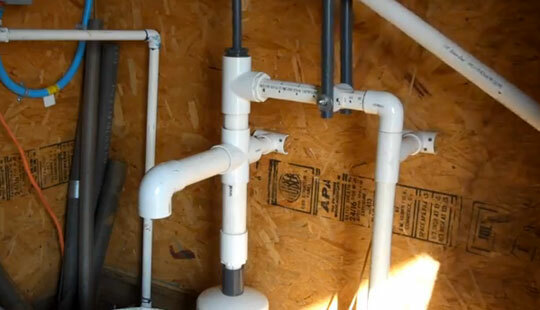 Do not use a larger ball than 3/4 inch diameter in a 1 inch pvc schedule 40 pipe. The balls will need a retainer that allows only about 3/4 inch movement. With the retainer the balls will stay close to the seat and will make faster valve action.